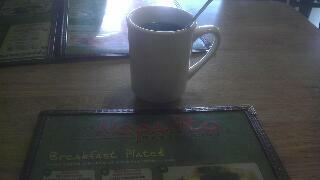 Stopped in New Braunfels, Texas for breakfast. Ordered a cup of coffee to go with the meal. This one gets an "It'll Do" Rating. Did not have enough to make a "Good Cup of Coffee" Rating. Served hotter it might have gained more ground but even a fresh pot did not change our minds.